DAP parliamentary leader Lim Kit Siang wondered aloud yesterday as to how both the Prime Minister and his deputy could be out of the country this week. “Why is the 30-year standing rule or of longer vintage that both the Prime Minister and Deputy Prime Minister should not be out of the country at the same time being broken this week?” he said at a press conference in Parliament yesterday. Prime Minister Datuk Seri Abdullah Ahmad Badawi is currently in Uzbekistan for a four-day official visit, while his deputy Datuk Seri Najib Razak will leave for the 16th Apec Economic Leaders Meeting (AELM) in Lima, Peru today. According to Lim, Abdullah will only be back on Nov 21 while Najib returns in early December. “Who will be the Acting Prime Minister in these two days when both the Prime Minister and Deputy Prime Minister will be out of the country?” Lim asked further. “It cannot be Tan Sri Muhyiddin Yassin, who is the front-runner for the election for Umno deputy president, as he will be leaving together with Najib tomorrow for Peru,” he said, referring to Umno party polls in March. Lim also ruled out the possibility of the most senior Minister in the Prime Minister’s Department, Tan Sri Bernard Dompok or the newly elected MCA president Datuk Seri Ong Tee Keat as it would fall foul of Umno MPs. “This is of course anathema particularly to Umno MPs who cannot even accept the clear-cut constitutional position that the post of Prime Minister is open to any Malaysian regardless of race, religion or territory,” Lim commented. Lim concluded by calling the Prime Minister’s Office to disclose to all Malaysians the number of times in the past 30 years when both the Prime Minister and Deputy Prime Minister have been out of the country at the same time. The Ipoh Timur MP also called on Najib, who is also Finance Minister, to clarify the status of his RM7 billion stimulus package before leaving on his long trip. 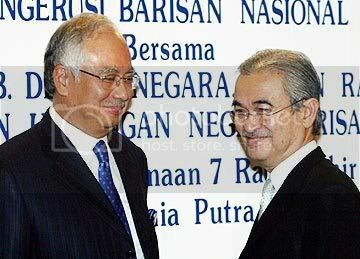 “Najib should not leave behind a RM7 billion ‘black hole’ but direct Second Finance Minister Tan Sri Mohd Nor Yakcop to incorporate the package into the 2009 Budget for parliamentary approval,” he said. The RM7 billion plan which Najib announced in his winding-up speech for the budget debate has been a bone of contention as the opposition continues to insist that the details have not been approved. The government’s stand however is that no allocation in the budget has actually been changed as the RM7 billion will be sourced from fuel subsidy savings and it is up to the Finance Ministry to issue an “administrative order” to carry out the projects which Najib has said will roll out early next year. The I.S.A is in charge. I am in charge! any problem? the beutiful heart of malaysian people in charge.